Nkosinathi Mbuya: Malnourished in Colombo? Urban children (file pic): How many are malnourished? Would you expect to encounter such a case in Colombo? Probably not. Yet, many children in the city could be malnourished, explains Nkosinathi, who provides nutrition technical support to the World Bank’s nutrition teams in Sri Lanka and Bangladesh. “In Sri Lanka, for example, there is increasing recognition that malnutrition in urban slums is a growing problem and one that needs focused attention,” he says explaining that families residing in urban slums face similar challenges (and sometimes even worse) than poor rural families. Unlike rural communities that might be able to grow their own food, urban families have to purchase theirs. As food prices soar, this only gets harder. There are many other issues as well: such families may also struggle with poor sanitation facilities and lack of clean water and if both the father and mother have to work, which is likely in an urban setting, young children may be left in the care of their scarcely older siblings who are unlikely to be able to feed them well. Another surprise comes when one discovers that some of these cases can be found outside the shanty towns – malnutrition cannot be blamed on poverty alone and is seen across all socio-economic backgrounds. “In South Asia, although malnutrition is highest among the poorest households, it is however still prevalent amongst the well-off households,” says Nkosinathi. Malnutrition is not just about a lack of nutrients – over-nutrition can be as much of a problem as under-nutrition. 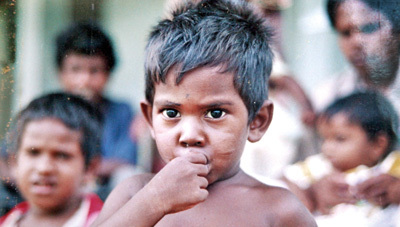 “The facts that under-five children of even the richest quintiles show 10-12% underweight prevalence and that over-nutrition and under-nutrition are present side by side, sometimes in the same family, show that absence of food alone is not the primary determinant of under-nutrition in Sri Lanka,” says Nkosinathi. In other cases cultural beliefs and certain myths relating to infant and young child feeding can also play a negative role in the nutritional well-being of children and pregnant women. These include pregnant women trying not to gain weight so that they can have an easier labour (while labour may be easier, the child is actually born malnourished with a low birthweight) and other practices such as discarding colostrum or ‘first milk’ and not feeding eggs and meat to children. Malnutrition can leave an individual weakened for life – and far more likely to succumb to disease. For instance, a child with malnutrition is 30% more likely to die from an attack of diarrhoea than a child who was otherwise healthy. Malnourished children are more likely to develop diabetes, and hypertension and ironically, obesity. Malnourishment also takes its toll on the developing intellect, shaving IQ points off a child that later translate not only into lower school grades but measurably lower adult earnings. Malnourished mothers tend to have malnourished children. “Sri Lankans, especially among the poor, are small, and they end up giving birth to small made babies who grow up to be small children,” says Nkosinathi. It can be something of a vicious cycle. While little can be done to reverse the effect of malnutrition in an adult, the good news is that there exists a 1000 day period during which malnutrition in children can be tackled successfully. While the count begins at conception and goes on till 2 years of age, it’s important to appreciate that a woman’s nutrition status even before she gets pregnant can impact her baby’s welfare. For institutions and organizations trying to help, this is a real window of opportunity says Nkosinath: “There is general consensus that the damage to physical growth, brain development and human capital formation that occurs during the first 1000 days of life is extensive and largely irreversible. Any investments after this critical period are much less likely to ensure that the child reaches their full potential.” However, nature has arranged that for the first six months at least, the child need look no further than the mother’s breast for nourishment. Ideally, children should be fed nothing but breastmilk and not even water during this period. Later on, it’s advisable to continue breastfeeding while offering the child supplementary foods. Even a malnourished mother will produce the same quality of milk as a healthy one. Babies are in fact, ‘perfect parasites’ able to coax all the nutrients they need out of their mother. However, this could happen at the expense of the woman, impacting her health adversely unless she too is taken care of. For many organisations working in the field the solution seems to lie, at least in part, around finding ways to incorporate micronutrients into common foods – this includes things like fortifying oil with vitamin A and salt with iodine as well zinc supplementation for young victims of diarrhoea. In Sri Lanka, programmes in the North and East as well as in the estate sector are working with some of the most vulnerable groups. There’s also high level political commitment to tackling malnutrition in the country. Tags: Malnutrition isn't caused by poverty say World Bank specialists. Bookmark the permalink.